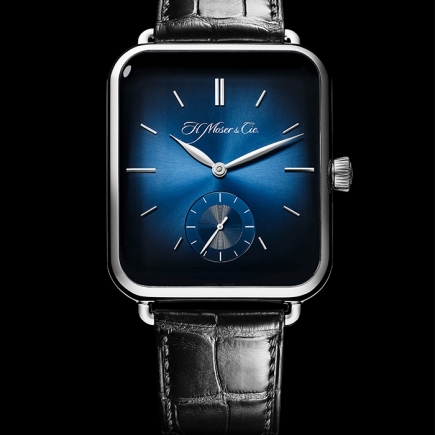 In 2015, H. Moser & Cie. is making a statement. 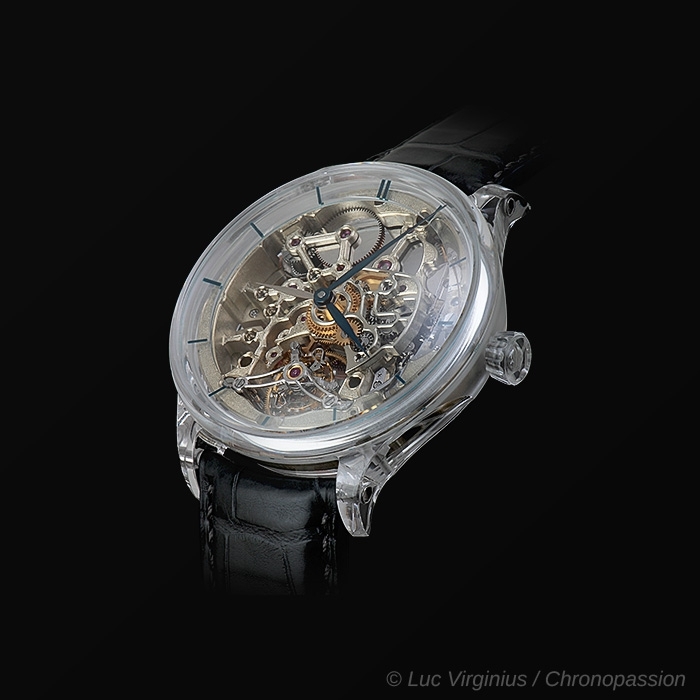 Bold and irreverent, the Neuhausen Manufacture is proud to unveil a masterpiece, one which combines an unprecedented skeleton movement, a case made entirely from sapphire crystal and a strap created using 3D printing – a world first. 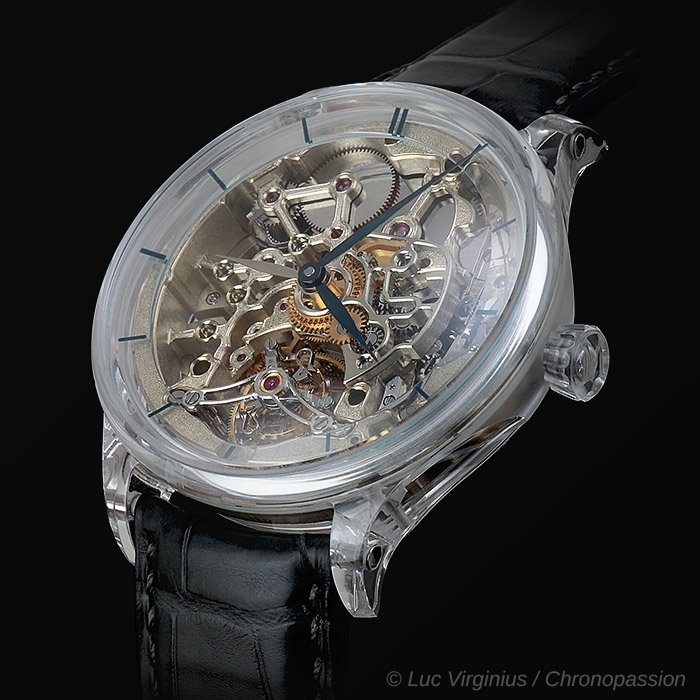 The Venturer Tourbillon Dual Time Sapphire Skeleton, with a combination of three innovations, is a remarkably winning overture. For its talking piece this year, H. Moser & Cie. has selected the Venturer collection, which boasts elegant and refined, sensual curves. 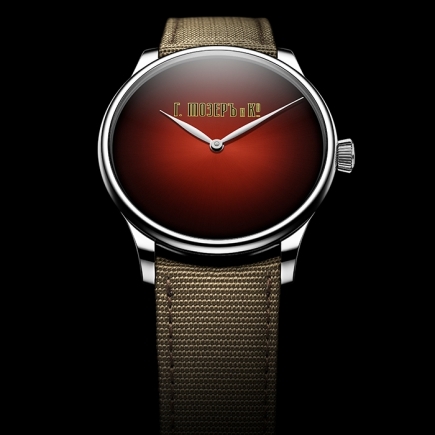 The exception being that this version will have a case created entirely in sapphire crystal. 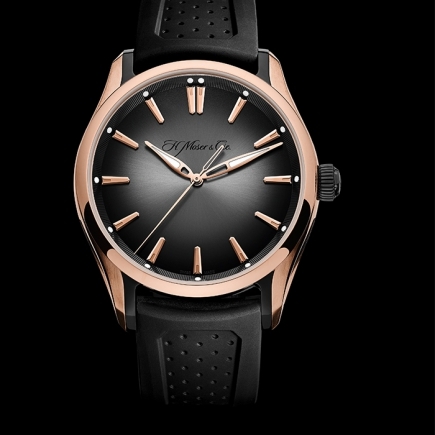 The finish to the profile of the case with its unusual shapes, the exquisite bezel, the curve of the dial and the crystal, and the proportions which echo the convex forms of the 1960s: the beauty of all these features is amplified by the transparency of the sapphire crystal case. 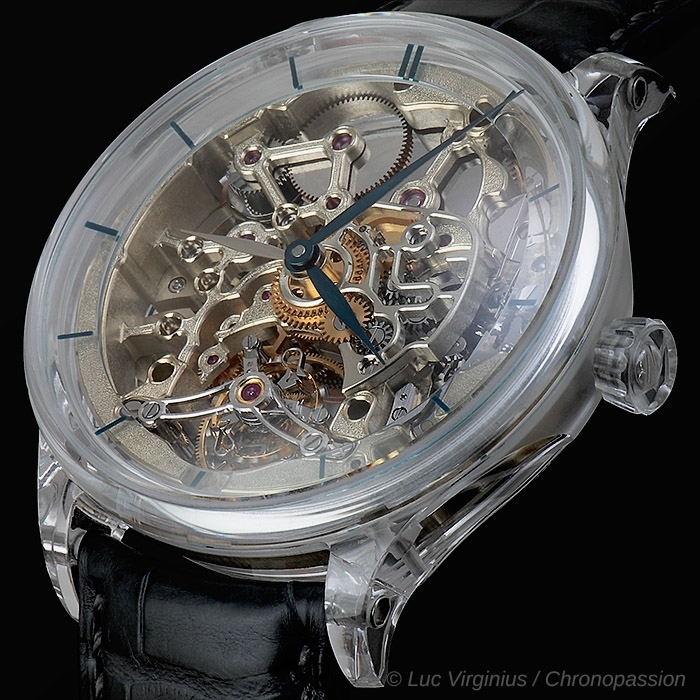 The solid sapphire case was created using a technique that very few people in the world have mastered: the Kyropoulos method. Starting with aluminium oxide, this revolutionary crystallisation process is used to create large ingots of sapphire crystal which are highly uniform and of an excellent quality. The sapphire crystal is then cut and worked with the greatest of care. 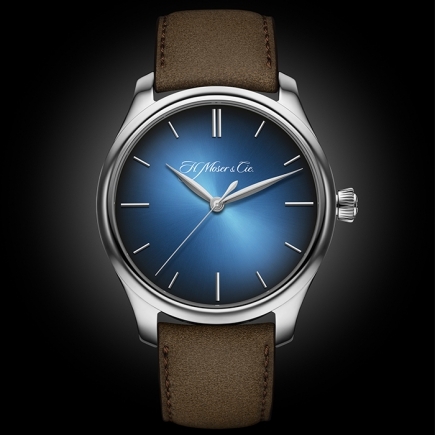 To obtain such a result, H. Moser & Cie. has accomplished a feat of technical prowess. 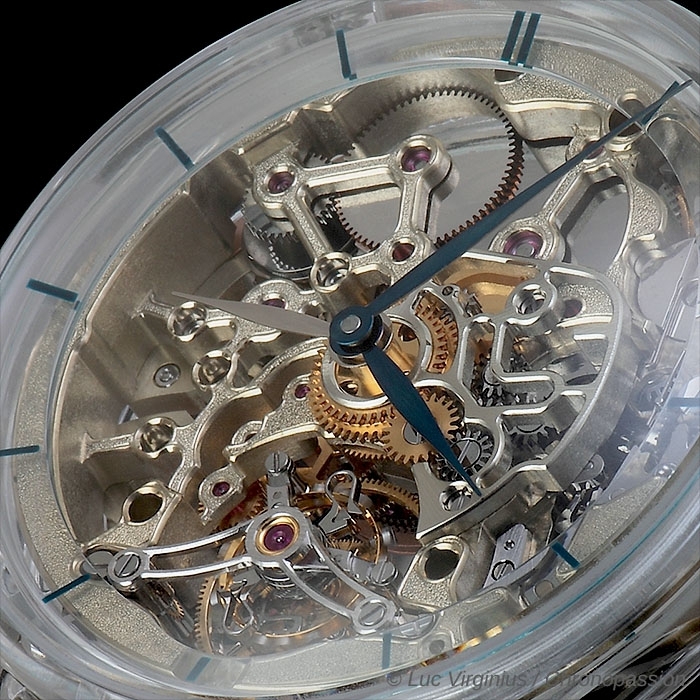 This transparent sapphire case highlights the beauty of the HMC 803 calibre, which is entirely skeletonised. 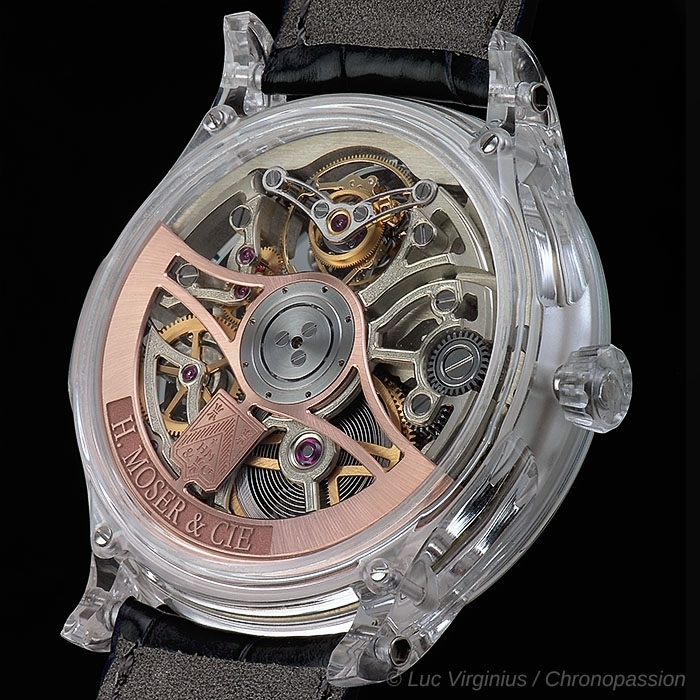 The bidirectional rotor, made from 22-carat solid red gold, is also open-worked. Fascinating and hypnotic, its oscillations set off the various materials and surfaces. 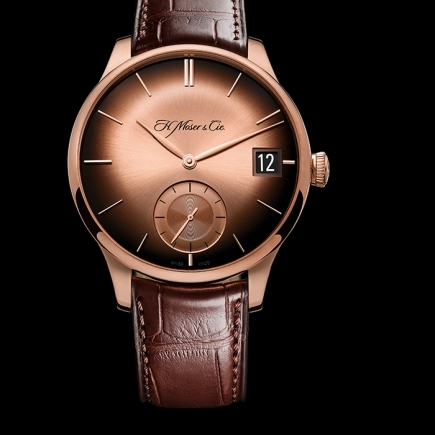 Playing with surprising contrasts, H. Moser & Cie. uses this setting to showcase a most traditional and exceptional watchmaking complication, the tourbillon, giving it a contemporary twist with both lightness and subtlety. 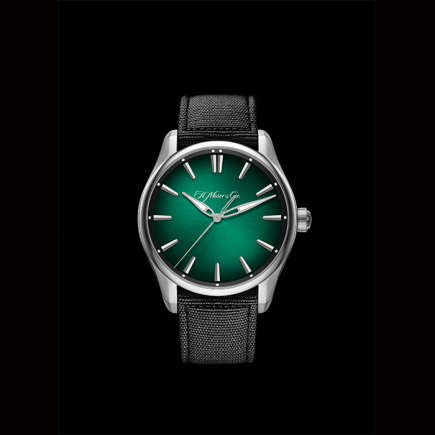 The Manufacture opted for a movement in nickel silver (or German silver, which is a brass alloy enriched with nickel), a choice dictated by history. Before the use of solid brass, all calibres were created from this alloy of copper, nickel and zinc. 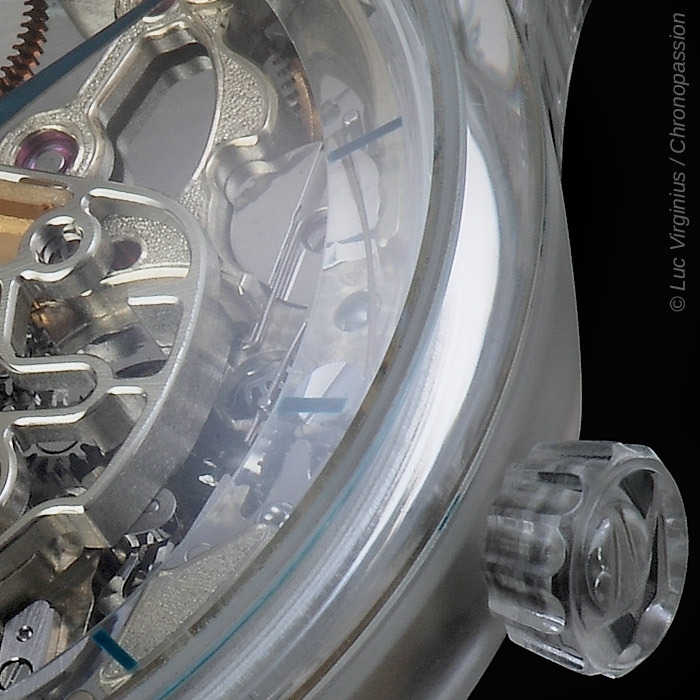 More complex and difficult to work, this alloy is, however, more beautiful and possesses a highly symbolic value. 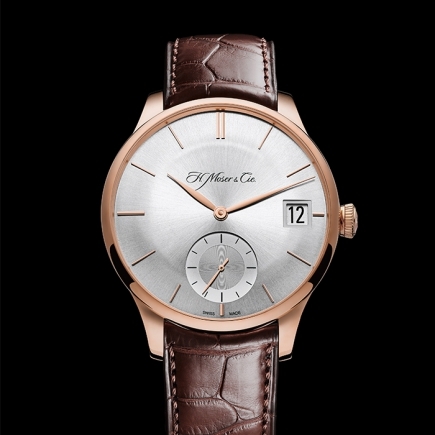 The alloy oxidises slightly before stabilising completely, ensuring the mechanism exudes an eternal beauty. 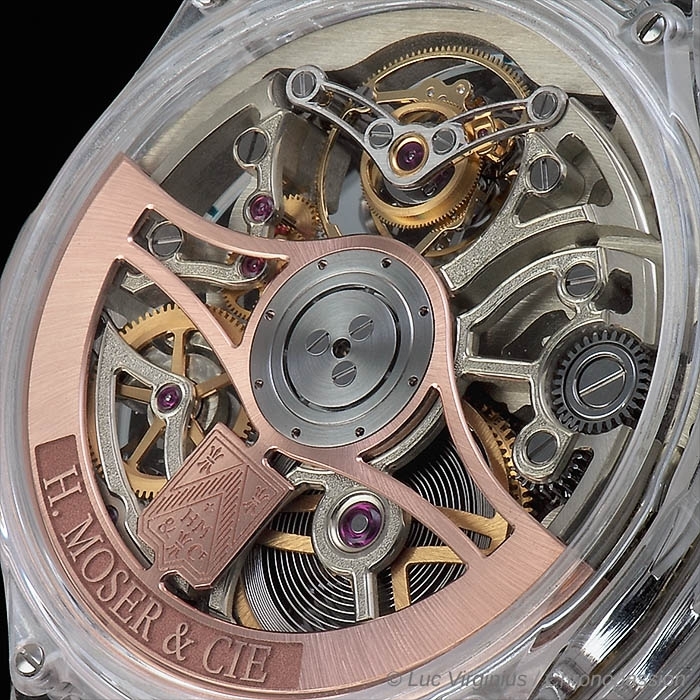 H. Moser & Cie. takes this approach to its extreme with the superlative appeal of the Venturer Tourbillon Dual Time Sapphire Skeleton. 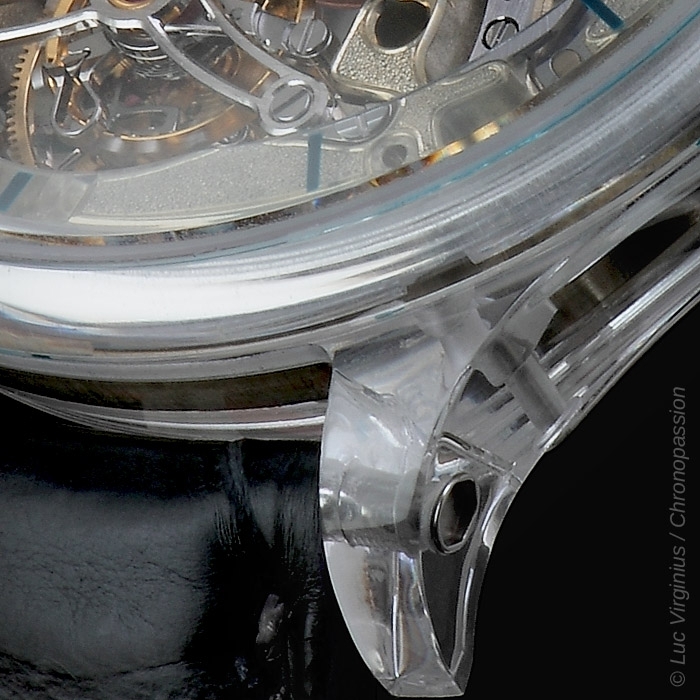 The entire surface of the HMC 803 calibre is carved with a decoration that took almost 100 hours of work, and which further reinforces the unique nature of this exceptional watch. 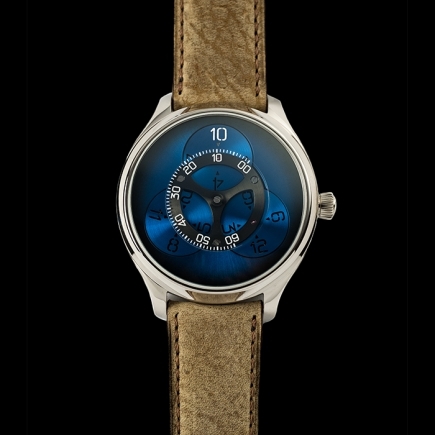 Finally, the Manufacture is equipping its masterpiece with a second time zone, indicated by a rhodium-plated hand, which can be easily distinguished from the blued steel hour and minute hands, and, of course, an Moser interchangeable minute tourbillon, boasting an original Straumann Double Hairspring®. 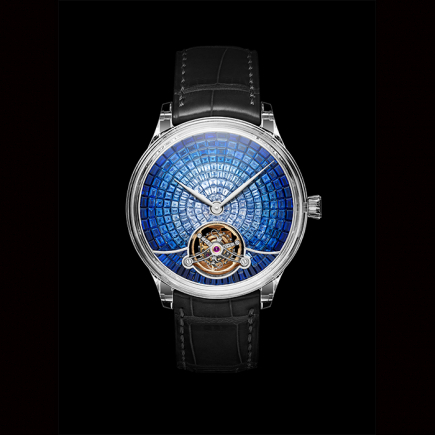 This stroke of genius for a watch is intended to make watchmaking history and transcends the advantages of a simple tourbillon. 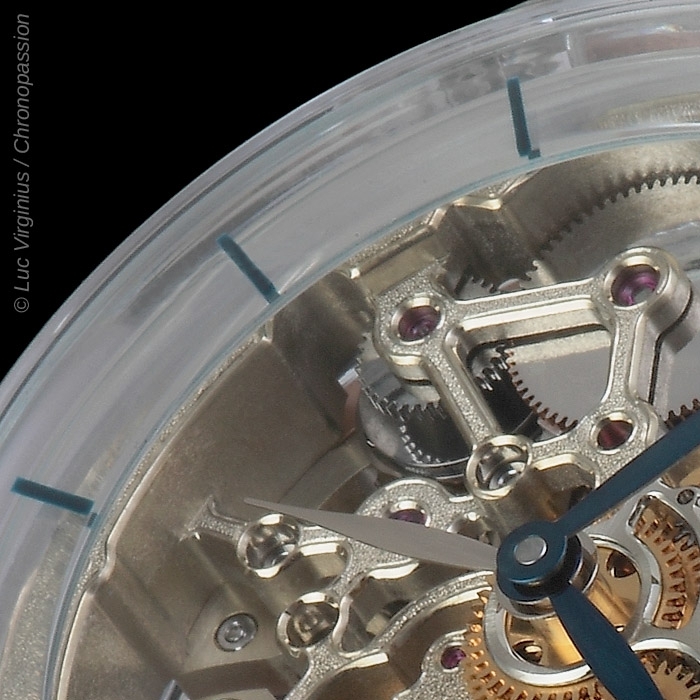 The strap fitted to the sapphire lugs of the Venturer Tourbillon Dual Time Sapphire Skeleton features a delicate structure, like interwoven lace; abstract, almost organic, forms appear and disappear amongst each other. Ethereal, playing with transparency, this strap is one-of-a-kind and was printed using 3D technology, a world-first in watchmaking. 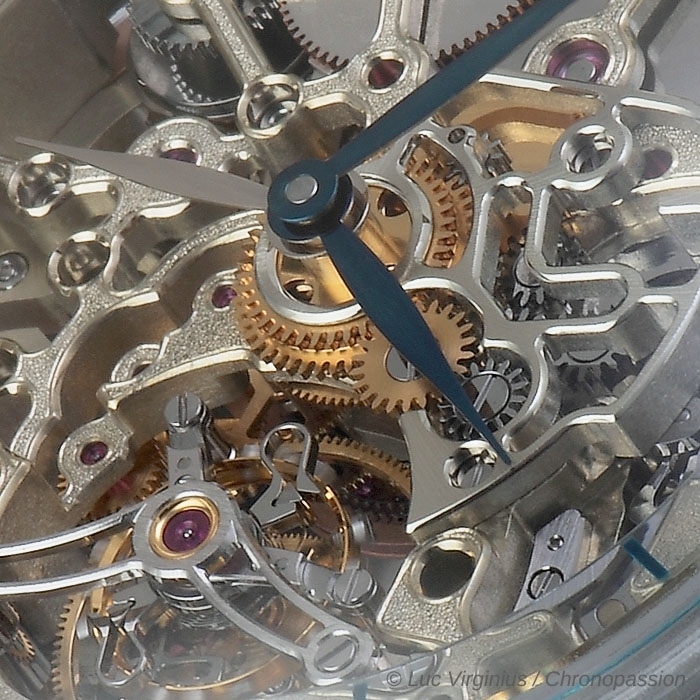 It would actually be impossible to produce this incredibly complex structure using traditional methods. Incredibly lightweight, with dimensions as compact as possible, this strap reveals new perspectives and hitherto unimagined possibilities of production with rubber. 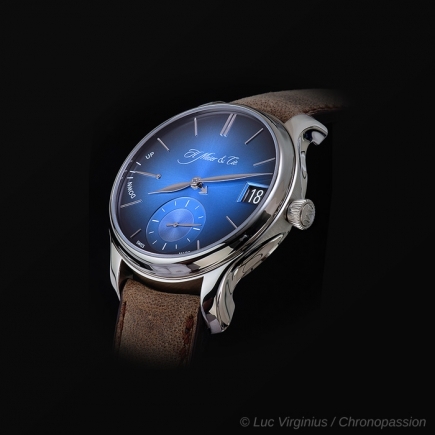 Its beauty complements this unconventional model with a bold, innovative and slightly provocative design. 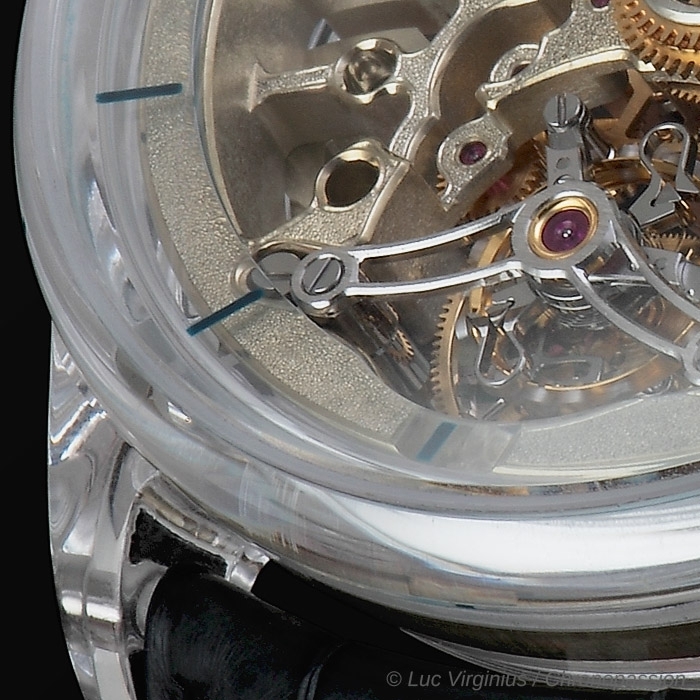 Never has a tourbillon been any less conventional!